In my blogs on Brexit, I expressed my astonishment that UK politics was more or less united over Brexit, while UK population is deeply divided. 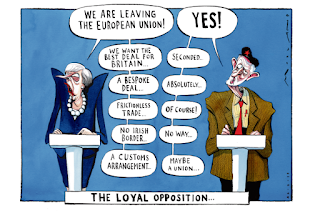 This is no longer the case because UK Labour now wants to be in "a" customs union with the EU. This may sound trivial but it is not. I am inclined to conclude that (a bit of) common sense has returned to UK politics. News media are concluding that this is hurting Mrs May's position. I do not believe that. The new position of UK Labour will make it easier for Mrs May to steer towards her goal. I still believe she has a goal although "seeing is not believing" in this case. Hence, the title of this blog series: Mrs May's Machiavellian Moves. UK's Brexit debate is largely about ideology versus common sense. The almost 50/50 vote of the UK population is evidence for this. 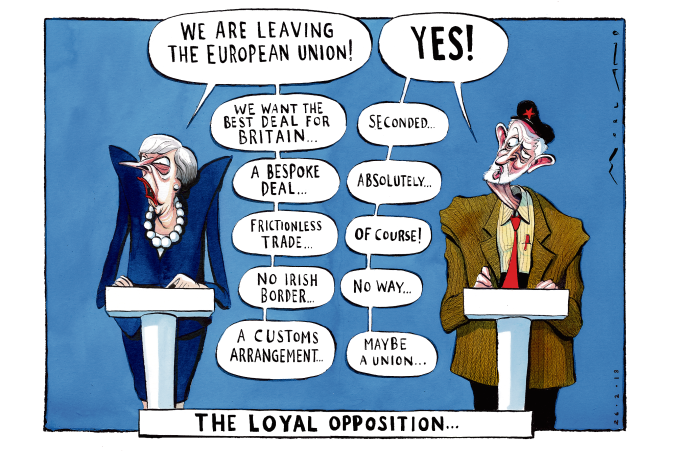 The superb cartoon by Morten Morland, as just published in The Times, illustrates that UK politics was largely about ideology (Brexit = Brexit) - until last weekend. I suppose that Labour's U-turn was fed by its hunger for government power. 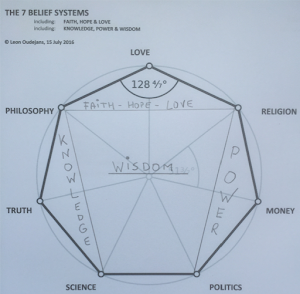 Power is stronger than ideology and/or common sense. The return of common sense to UK party politics will benefit the UK population. There is - once again - a choice. I suppose that Labour's leader must have realised the same. Almost 50% of the UK population is not represented in Parliament. These votes could easily define the difference between having and not having Power. Hence, the U-turn. Mrs May has never been a Brexiteer and she defends Brexit with utter clumsiness and empty rhetoric. I think, feel and believe that she will benefit from Labour's U-turn as she can now steer the Brexit debate into safe waters rather than surviving on its fringes. The empty rhetoric of Brexiteers is already swelling: "Brussels accused of 'outrageous' attempt to turn Northern Ireland into EU province by rejecting British compromises" (Telegraph). This empty rhetoric will get worse because the prospects of a (hard and soft) Brexit are diminishing. It's still hard to predict whether common sense will ultimately prevail over ideology in the UK. Yet I have confidence in Mrs May's Machiavellian Moves. She has already come a long way there, although it's still a long way to where she is going.